Tour Today & You Could Win Tickets to See OSU vs. Michigan! The Next 10 To Sign For A 2x2 Get $500! Uncommon is effortlessly changing the conventional conversation. Uncommon is confidently making face-to-face connections. Uncommon is forging your own path through unpredictable life experiences. Reject the status quo at Uncommon Columbus, your getaway from the everyday. This unique community is designed specifically for those seeking something different from the usual, boring housing options. Find camaraderie with others looking to escape the over-crowded, cookie-cutter complexes that are common in Columbus and all across the country. Our distinctively Uncommon atmosphere encourages residents to live life to the fullest, with energy and enthusiasm for the things they love. Soak in the hot tub after a long week, or take out your stress in the state-of-the-art fitness center. Our goal is to provide a world-class living experience in a warm and welcoming environment. Uncommon Columbus residences are comfortable yet refined, with beautifully-appointed floorplans and designer furnishings that feel simultaneously intimate and lavish. 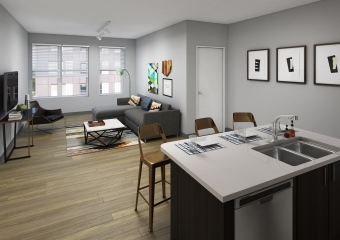 Stainless steel appliances, quartz countertops and designer bathrooms all come standard in each apartment, so you can enjoy upscale finishes without sacrificing convenience. We also provide advanced security to help maintain the safety of our residents. On-site maintenance staff, 24/7 emergency service, and electronic access help give you peace of mind, knowing your building, your apartment, and your belongings are safe and secure. We are located on North High Street, nestled between South Campus and The Short North and on the doorstep of The Ohio State University. 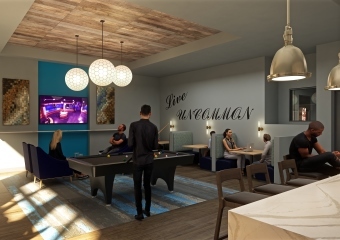 It’s the ideal location for those who desire easy access to OSU but also want to enjoy the vibrant, active lifestyle of Columbus, Ohio. Walk to campus, restaurants, shops or the grocery store, and be a part of a growing community that’s defining a character all its own. Uncommon is creating a world of adventure just outside your front door. Live Uncommon.